CURIOUS LITTLE BIRD: My first embroidery felt art, and a new monster face. My first embroidery felt art, and a new monster face. It's Tuesday, the day after Boxing day here in Canada. I made my coffee, fed the cats, and the first thing I see in my inbox from the news is that 3 people got pepper sprayed in a Winnipeg mall while shopping for Boxing day. They didn't say why they were pepper sprayed, but my assumption would be that there was say 1 television left on sale, and 3 people wanted it. Wow. I don't buy into the sales after xmas. I thought about it, so I checked out the online flyer, and to be honest, most of the TVs on sale were perhaps $10-30 cheaper than they would be if it weren't Boxing day. Why the pepper spray then? So as promised, I finished my embroidery felt hoop art and photographed it for you. I modeled it after a sketch I did a few years ago while I was planning my trip to Japan. In the sketch I originally embroidered my name in Japanese like this メラニー but I thought it might be nice without it. When I sketched the cat, I was thinking of the cat in Alice In Wonderland. On top of that, I also took a photo of a new monster I made with a new facial expression. I really like it and I think I can work with it. I think I'll name it Olive. Should it b a girl or a boy monster? I've been thinking about my business, what's selling really well and what's not. After months of craft fairs and sales on Etsy, I've noticed my furry monsters are selling the best, and the rest sell here and there, but not very often. I wonder... Should I just focus on making the furry monsters, or should I continue to make my other guys too (bears, foxes, bunnies)? I know the bunnies get a lot of positive feedback, as well as my foxes made out of recycled shirts. I don't want to limit myself to just monsters though, but I am calling myself the 'Monster Creator' on my business card which everyone seems to love. :-) Any thoughts on this? What would you like to see more of, and less of?? Have a great Tuesday and I look forward to your comments! Oh my goodness! 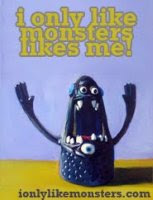 How cute are your little monsters! I love them! I just want to hug them and squeeze them and call them mine! Wonderful work!